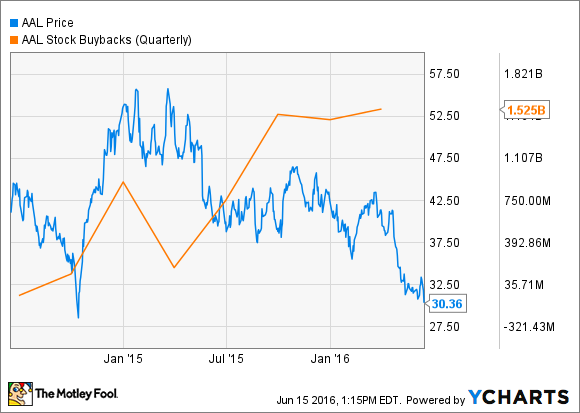 American Airlines Stock Sinks to New Lows: Will Buybacks Hit New Highs? American Airlines stock has fallen to just above $30. This could entice management to increase the company's buyback activity yet again. American Airlines (NASDAQ:AAL) was flying high at the beginning of 2015 as investors were optimistic about the combined impact of lower fuel prices and industry consolidation on airline profitability. Indeed, American Airlines earned a record profit last year. American Airlines produced another record profit in 2015. Image source: American Airlines. However, investors haven't been too impressed lately, as American's persistent unit revenue declines have called into question the sustainability of its profitability. As a result, American Airlines stock has been on a downward trajectory for more than a year. The further the stock has fallen, the more cash management has spent on share buybacks. With American Airlines stock recently hitting a new 52-week low near $30 -- close to its lowest level since the AMR-US Airways merger -- American Airlines may set a new record for share buybacks in the current quarter. American Airlines' aggressive share repurchase strategy has plenty of detractors. Indeed, while the company has bought back a lot of stock in the past year, that hasn't helped arrest its stock slide. On the other hand, it's hard to argue with the timing of its share repurchases. American's management hasn't been indiscriminately buying back stock just to prop up earnings per share. It bought back very few shares in early 2015 when American Airlines stock was near $50. By contrast, American has ramped up its buyback activity whenever the stock was near (or below) $40. The first big spike in share repurchases came in Q3 2015, as American Airlines stock pulled back to around $40 even as the company reported a series of record profits. In that quarter, it spent $1.56 billion to repurchase 38.4 million shares. American Airlines stock recovered somewhat in late 2015, so it cut back slightly on share repurchases in Q4, spending $1.1 billion. However, after the stock plunged in January, the company ramped up its buyback activity again. Last quarter, American Airlines spent another $1.56 billion to repurchase 39.3 million shares. Based on the company's liquidity, borrowing, and capital spending targets set out earlier this year, American Airlines probably has the flexibility to spend as much as $5 billion on share buybacks this year. Since late April, American Airlines stock has been stuck below $35. Due to the lower stock price, if the company spends $1.56 billion on share buybacks again, it would probably be able to retire more than 45 million shares: a new record for a single quarter. However, as noted earlier, American's management has tended to spend more money on share buybacks as the share price has fallen. If the company instead spends $2 billion on buybacks, it could potentially repurchase close to 60 million shares this quarter: roughly 10% of its outstanding shares. Are more buybacks a good thing? American Airlines' stock buybacks will help bolster its earnings per share, all else equal. But this doesn't mean that they are necessarily good for shareholders. That depends on whether American Airlines can sustain its profitability in the coming years. The good news is that American Airlines' unit revenue trends could start to improve in Q3 due to lower competitive capacity growth in the U.S. and stabilization in Brazil. New revenue-generating initiatives such as the introduction of basic economy fares and international premium economy seats will provide a further boost in the next couple of years. Presumably, American Airlines shareholders are optimistic about the company's prospects and expect these initiatives to help American maintain its double digit pre-tax profit margin. From that perspective, American's share buybacks look like a no-brainer. However, with revenue slumping and fuel prices starting to rebound, it's possible that American's margins will erode rapidly over the next year or two. In that case, American Airlines may be throwing good money after bad -- perhaps even threatening its long-term solvency -- by spending ever-increasing amounts of cash on share buybacks. I fall into the first camp. Last year's record high 15.3% adjusted pre-tax margin may have been unsustainable, but I expect American Airlines to be profitable enough in the long run to justify a significantly higher share price. But the evidence isn't clear-cut either way. Thus, American's huge share buybacks make American Airlines stock a particularly risky investment.